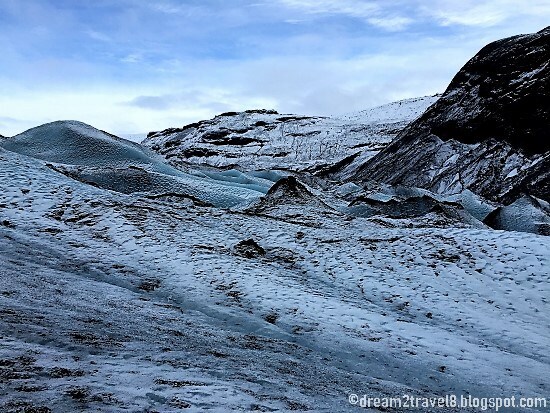 This day was the day that my husband and I had looked forward to the most ever since we touched down in Iceland - the day when we embarked on our Golden Circle tour. Filled with anticipation for the tour, my husband and I woke up super early and managed to pack our stuff, check out of our accommodation and waited at the pickup point way ahead of the scheduled timing. Even then, it was not a long wait before we got onto our ride and joined the rest of our tour mates on the journey to southern Iceland! Our group consisted of 17 people including our driver and guide and the travel van was our main mode of transport for the next few days. 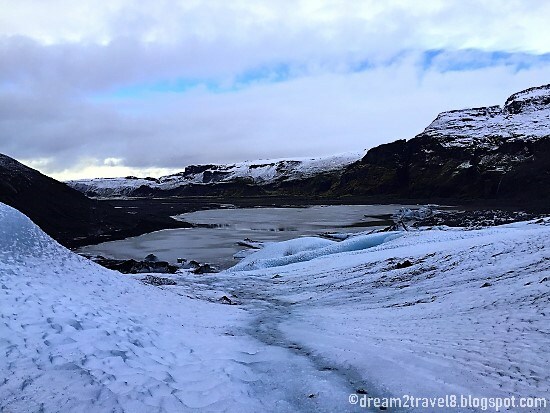 When we board the van, we could see that everyone was as excited as we were for the trip and all of us could hardly wait to see the extraordinary landscapes of Iceland! After what seemed like a long drive from Reykjavik, we arrived at our first destination for the day - Seljalandsfoss, the most visited waterfalls in Iceland with a drop of 60 meters. Seljalandsfoss is unique in that it had a pathway that stretches all the way around the waterfall. We had long heard of this waterfall and seen many beautiful photos of it in the social media but were quite disappointed when we actually saw it with our own eyes. 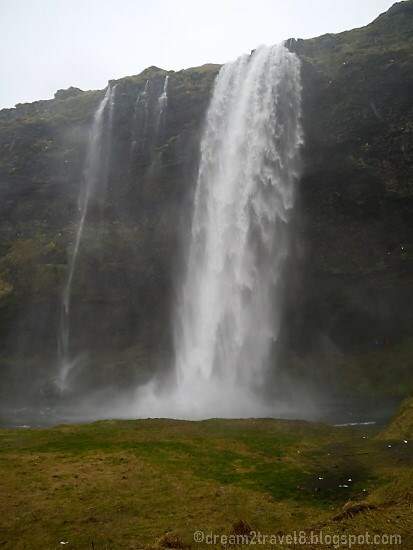 It was without a doubt that the waterfall had a very majestic and impressive outlook with its towering height and the forceful speed of the water. However, the brown and barren land surrounding it made it lose some of its aesthetic appeal. Furthermore, the pathway behind the waterfall was still covered in ice and was very slippery. In view of that, my husband and I decided not to venture there to minimize risk of falls. Our attempts to take a selfie when standing at a closer proximity to the waterfall (but still quite a distance from it) was also hindered by the tons of water splash as the waterfall crashed onto the pond of water located at the bottom of the cliff. We were left drenched and without a proper photo - what a way to start the day! Look at that water splash! Disappointed, we slowly made our way back to the van and it was a short drive before we reached the next destination - Skógafoss (another popular waterfall, situated on the Skógá River in the south of Iceland). Our eyes literally lit up when we saw this next destination. the landscape here was drastically different from that seen at the previous stop. 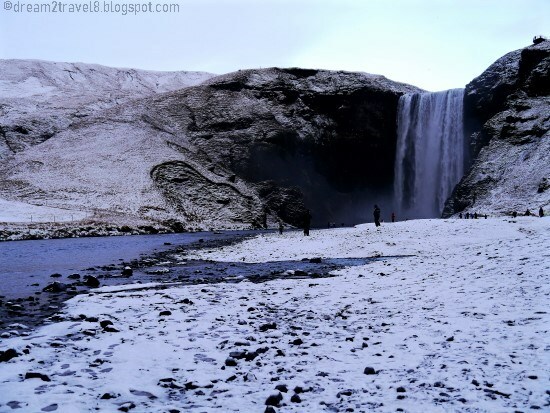 The land surrounding Skógafoss was covered in snow! 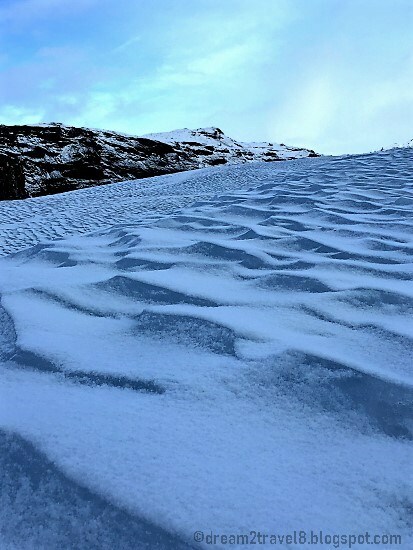 The white snow coupled with the dark colors of the land against the backdrop of the massive Skógafoss evoked a rather surreal feeling and the scene was just gorgeous! 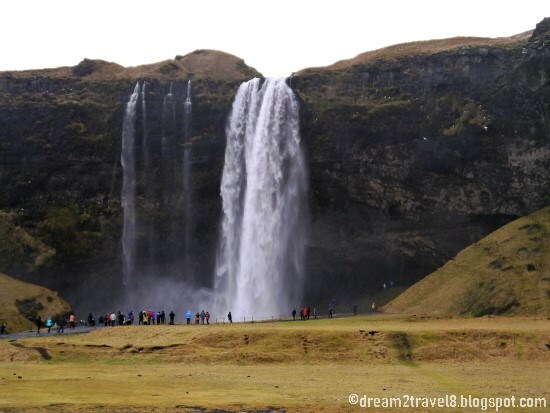 Skógafoss, with its towering height of 60 meters and width of about 25 meters, had an impressive outlook that was not inferior to that of Seljalandsfoss! I had finally understood what my friends meant when they said that the landscape in Iceland can differ quite a lot from one location to another. 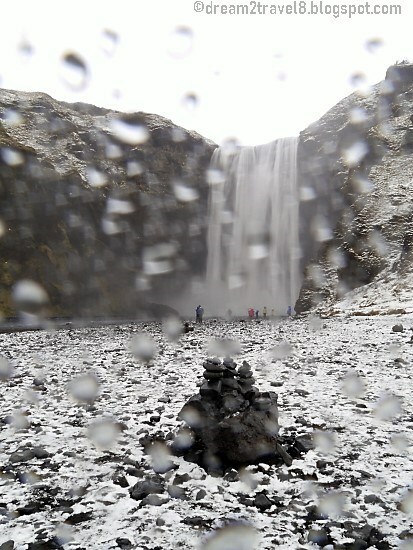 Skógafoss had given us a new lease of hope and we started to be more optimistic about what is in store for us for the rest of this day. It was another long drive before we arrived at the third stop for the day - Sólheimajökull, a glacier in southern Iceland, between the volcanoes Katla and Eijafjallajökkull. It was time for some glacier hiking! 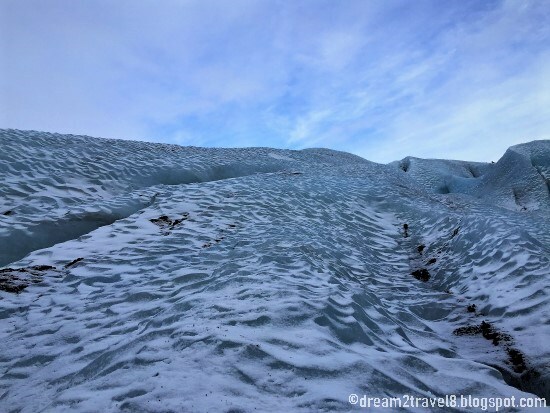 I had never seen a glacier prior to this and everything around me seemed very new and interesting, I was literally getting quite overwhelmed with this mysteriously beautiful sight! For safety reasons, our group was further split into two, with each group following a different glacier hiker guide. Our guide was a rather stern young chap who led us to the a spot where the glacier hiking equipment were neatly arranged on the floor. Following his prompt instructions, we each picked up a set of hiking equipment and followed him to another spot further up. 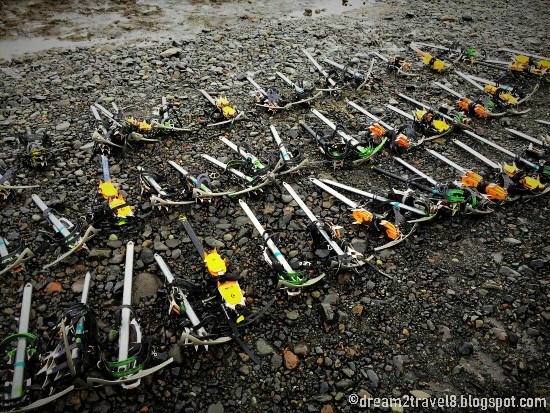 There, our guide demonstrated to us on how to put on the crampons and the correct way to use the glacier hiking stick. After a brief lecture of the safety aspects to note for the hike, our group proceeded on further into the glacier. Right from the beginning, I was lagging behind as I found it rather difficult to walk with the crampons on. 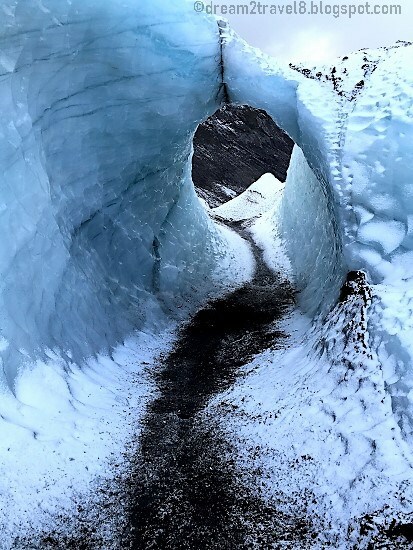 Noticing my struggles, my husband suggested for me to step harder onto the ice so that the crampons can have a better grip and thus allowing me to walk with more ease. It worked! 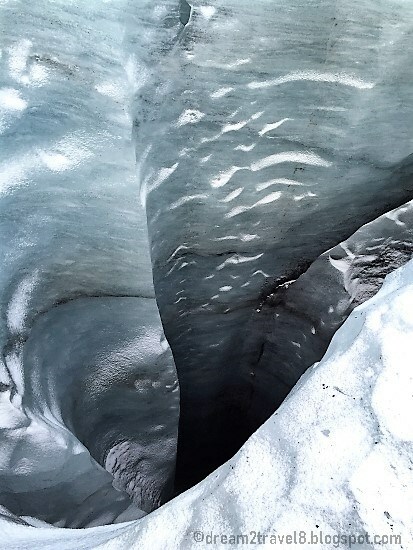 I no longer had to struggle with my crampons but rather was able to admire the view of the glacier up close! Along the way, our guide showed us many things - including a huge hole that went all the way down (it would be disastrous if any one was to fall in), how clean the glacier was (by breaking off a small chunk of glacier ice and popping it straight into his mouth) and the proper setup for an vertical hike up the huge chunks of glacier ice blocks (and for us to take our “hiking” photos). It was a fascinating and interesting hike and unlike the many others that we had experienced! 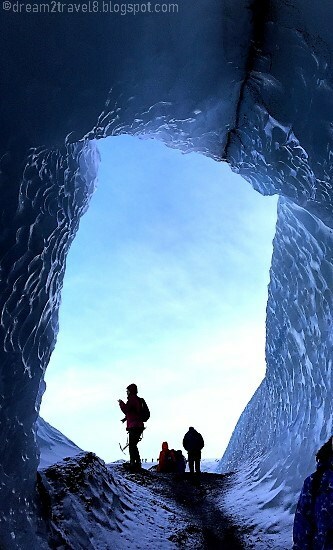 Reaching the top of the glacier, we were given some time to take some photos. The view was phenomenal. At this point in time, the sun was already setting and the sun rays reflected on the glacier was one of the most beautiful sights that I had ever seen! I knew I should have brought my camera up with me on that hike! 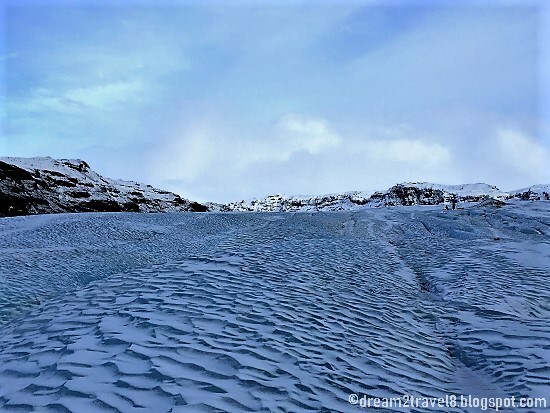 Nevertheless, looking out into the glacier, I became lost in this natural landscape which seemed to stretch for endless miles and suddenly everything just seemed so insignificant compared to it! It was certainly a wonderful and therapeutic experience! After taking tons of photos at the glacier, we made our way back to our van where everyone was desperate for a rest after hiking for close to 3 hours. 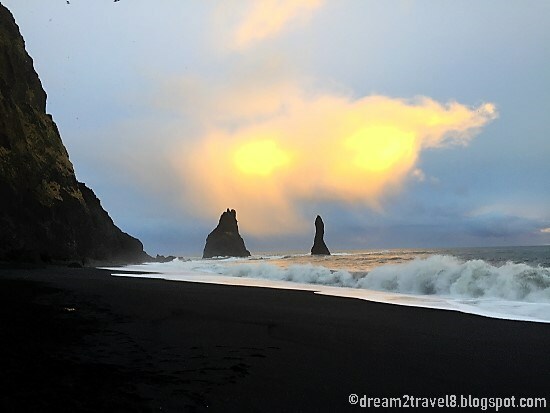 It was yet another long drive before we arrived at the final destination for the day - Reynisfjara Black Sand Beach, situated under the mountain Reynisfjall near the village Vík. 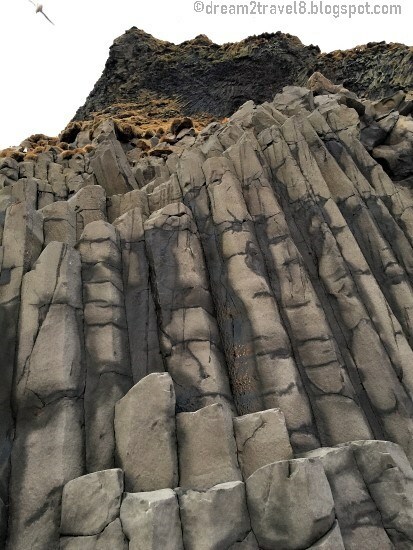 This beach is famous for the basalt sea stacks (or Reynisfjara), its black sand and the massive sea waves. The waves were seriously huge and our guide had warned us not to get too close as there were cases whereby people were swept away by these waves. 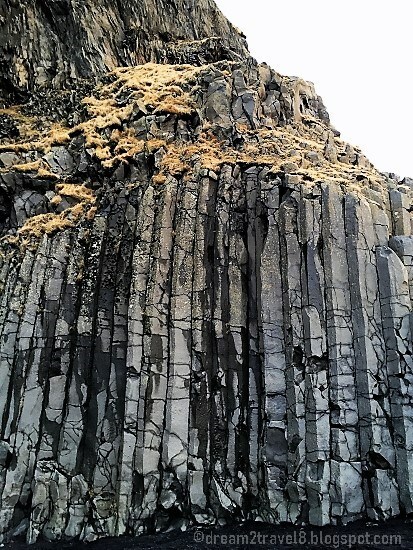 Without venturing too near to the coastal lines, my husband and I started to explore the basalt sea stacks and it was just fascinating how such beautiful structures can be found in nature itself! We spent some time admiring the view and the sea breeze before the cold got to us and we had to make a dash for the cafe nearby to warm up (my camera got fogged up due to the rapid change in temperature as well!). Look at that huge wave! 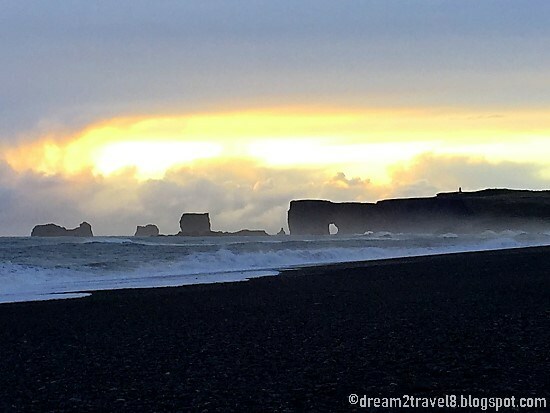 It was only the first day of the tour but my husband and I had already had so much fun and we were feeling very blessed to have the chance to see the beauty of Iceland with our very own eyes! We are certainly looking forward to more exciting adventures for the next day....stay tuned!! 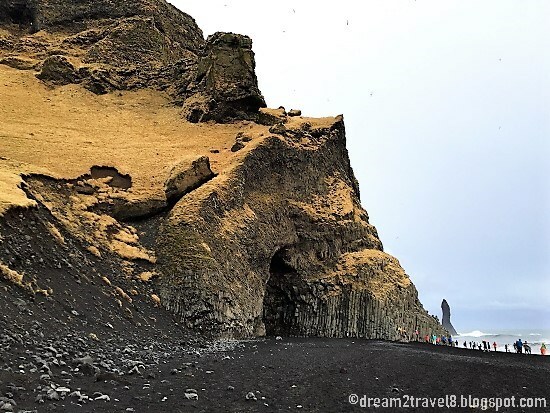 The glacier and black sand beach have such a stark contrast! That was a splendid day you and a sign of things to come in Iceland. Truly Iceland is a place that looks out of the world. You are blessed to have experienced the wild beauty of its landscapes. The waterfalls look spectacular and the glacier of course is awesome. Iceland is extremely beautiful. It's landscapes are simply stunning and surreal. The country is on my bucket list for so long and hopefully my next trip will be to Iceland. I'll make sure I'll opt for the Golden Circle Tour. All the places it has covered are endowed with a magical beauty and your beautiful pictures perfectly justify that. Thanks for sharing.